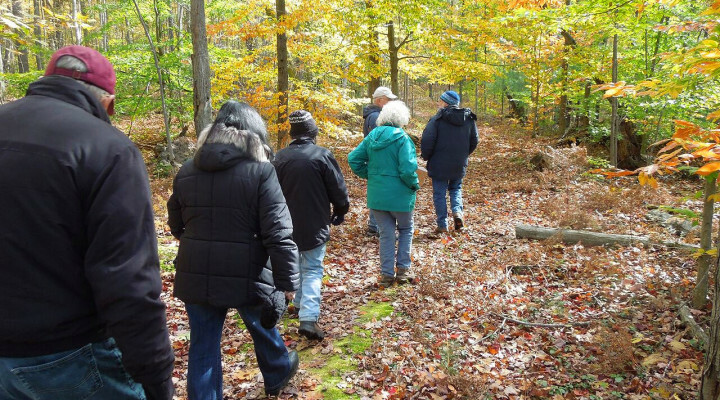 On October 18, a crisp, blue-sky day, the Third Annual Birds, Branches and Brunch trail walk at the Hall’s Lake Natural Area saw an enthusiastic crowd. More than 50 parked cars snaked along the shoulders of Old State and Broomfield roads. Visitors were able to choose from walking the trails on their own while stopping at five food and drink stations along the way, or participating in an organized walk. Local resident and historian Larry Schaftenaar led a longer than usual walk along much of the trail system, discussing Hall’s Lake history, and including a visit to the Osprey nest platform that was constructed several years ago by CWC volunteers and Hall’s Lake neighbors. Stan Lilley led a shorter, food stop-centered loop that featured a visit and update on the newly completed deer exclosure on the Kabana Preserve. We owe thanks to a large group of volunteers who made the event a success. Thanks especially to Jaime and Marc Griffis and family, Sue Ann Kopmeyer, Adonna Kennedy and Kathy Johns, Marilyn Fosburg, Central Michigan University’s Zeta Theta Pi Sorority, Boy Scout Troop 604, Rob and Janice Brune, Cathy Murray, and Larry and Judy Schaftenaar, and everyone who took time out to support this popular activity. Thanks also to our event sponsors, Pixie, Alison Miller, Mt. Pleasant Meijer, Tim Horton’s, Ric’s Food Center, Isabella County Parks, and Isabella County Commission on Aging. It was a gorgeous color day and a lot of fun. ← We’re Buying Bundy Hill!